These fantastic solar-powered LED lights by LittleSun are designed by German Artist Olafur Eliasson and innovator Frederick Ottesen to provide a practical, safe, and efficient source of artificial light for some of the 1.3 billion people worldwide who live without electricity. The light’s durable, versatile design includes a 6 cm x 6 cm single cell mono-crystalline solar module that when exposed to four hours of sunlight will yield five hours of bright LED illumination. Designed to survive three years of continuous usage, Little Sun’s neat construction and ingenious shaping allow it to be “used as a table or pendant lamp or as a hand-held lantern” at night, and to be easily carried during the day as it charges. The Little Sun lamp is a more healthy, eco-friendly alternative to kerosene lanterns, and it’s cheaper too. The cost of one Little Sun lamp (which lasts three years) is equivalent to the cost of three to six months of kerosene-fueled light. While we don’t have figures on exactly what cost that is, the benefits of the Little Sun appear to be huge. With innovations such as affordable clockwork powered laptops and radios bringing technology and communication to areas of Sub-Saharan Africa, the development of well-designed, affordable solar-powered devices to support this off-the-grid development is an exciting step forward. 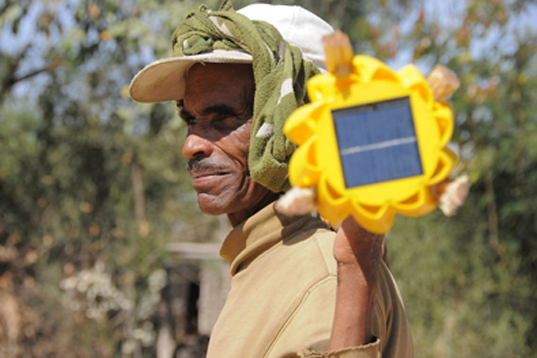 Slated for release this summer, the Little Sun LED light is the first project of Eliasson and Ottesen’s company LittleSun GmbH, which aims to create products that bring customers out of energy poverty. Learn more about this project and those to come in the future here. These fantastic solar-powered LED lights by LittleSun are designed by German Artist Olafur Eliasson and innovator Frederick Ottesen to provide a practical, safe, and efficient source of artificial light for some of the 1.3 billion people worldwide who live without electricity. The light's durable, versatile design includes a 6 cm x 6 cm single cell mono-crystalline solar module that when exposed to four hours of sunlight will yield five hours of bright LED illumination. Designed to survive three years of continuous usage, Little Sun's neat construction and ingenious shaping allow it to be "used as a table or pendant lamp or as a hand-held lantern" at night, and to be easily carried during the day as it charges.